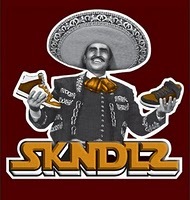 Here’s a group that I definitely co-sign, SKNDLS Clothing! Fresh casual wear for the streets and for the clubs. The founders are really cool too. I’ve also heard that new designs were out August 1st 2010! You ever wonder where djs get these cool looking customized labels for their vinyl and laptops? Well, here’s a site that I’ve found today. DjLabels.com specializes in all your sticker needs. From laptop skins to customized 12″ record labels, they do it all! Not so bad priced either. It’s all about customizing to stand out.